As a chiropractor that treats mostly expectant mothers and children, I see both baby-wearing and car seat carrying parents on a daily basis. I work with several other doctors in a clinic outside of Forth Worth, Texas, and collectively, we see much more car seat carrying than baby-wearing, and we try to discourage our patients from using their car seats outside of the car. Baby seat companies have made it incredibly easy for parents to transport their child in a car seat from house to car to final destination without ever having to move baby. It is such an easy thing to do, and with many families with multiple kids and crazy schedules rushing from here to there, I completely understand and sympathize with parents that choose to carry their kids this way. There are, however, many reasons why both my wife and I, as parents, and my colleagues and I, as doctors, do not recommend this type of baby carrying. 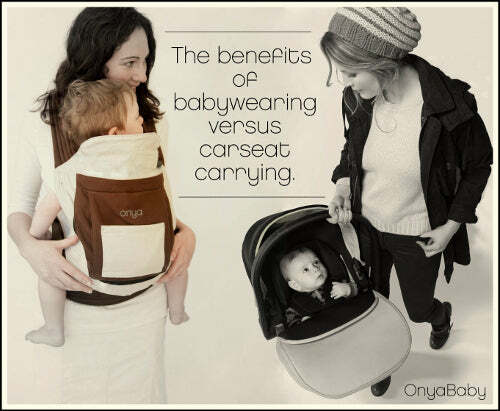 We will take a look at why baby wearing is one of the best things you can do for optimal structural, neurological, physiological, and emotional development for baby. Dr. Andrew currently lives outside of Fort Worth, Texas, with his wife Nicole and their 9-month-old son Luke. He is a chiropractor in a family clinic in the area, treating mostly expectant mothers and children. He is opening his own clinic in the beautiful Shenandoah Valley of Virginia this fall, where their children will be able to grow up around extended family. In addition to his doctor of chiropractic degree, he is also in the process of certifying for a diplomate in neurology as well as an advanced certification in pediatric care. Dr. Andrew and Nicole are enthusiastic babywearing advocates and will be establishing the Shenandoah Valley’s first babywearing library!